I call this blog "My Bag-a-licious Life", but rarely do I share with you how lucky and bag-a-licious life really is. So, I'm going to try and make a point to share more scoop not just about great bags, but the parties/previews/swag/and celeb shenanigans I encounter. I may also protest from time to time about the realities of not living in the city - ya sorry to burst that bubble in case you thought I lived in Manhattan. I'm a white picket fence kid of gal with dreams of having a bun in the oven soon. Any who, Tuesday was chock full of night-time events and I've made it a point to start going more often - at least 3 nights a month no matter how much is going in! First up on Tuesday was a 4pm Dooney & Burke fall 2009 preview that I skipped because I got pulled into a conference call. Once in my car, I was off to a 5:30pm Accessories Council event which I too had to skip because I got a call at 5:15pm that I had to take. So, there I was a few block away from the venue, sitting in my car working. By 5:50pm I was done with my calls, missed another event and had to jet to the Burju Shoe Launch at Nest Lounge. The event was orchestrated by my new friend (who followed me on twitter and spotted me during a fashion week party!) Alyson Campbell of AMP3 Public Relations. These sizzling heals are the brain child of professional salsa dancer, Burju Perez, - that's her in the sassy fuchsia pink dress. I'm a big lover of anything Latin so the Salsa music, the bold colors of the shoes, the life, the energy of the fashion shoes, the curvy models ... it was great. Many of the guests were placing orders - who wouldn't with a 20% discount and the ability to customize styles. If you see a Burju shoe you like the height of the heel can be customized from 1 ¾” to 3 ¾”. For more on this line check out http://www.burjushoes.com/. After mingling with LookOnline.com's Adrienne Weinfeld-Berg, SheFinds.com's CEO Michelle Madhock, HerPResign's Michelle Slaughter (who recognized me from twitter), and PR guy Jeremy Logan-Cavendish I was off again. By 7pm Jeremy and I were in my car heading to the Rivington Hotel for New York & Company’s Spring Event hosted by Carson Kressley. Carson, who was his usual witty and w arm self, shared his spring picks. Being the smart man that he is, Carson told me that accessories are the place to spend one's money because it’s the easiest and cheapest way to continuously update your look. We might be in a depression, but you don’t have to look depressed bagistas. “Add bold colors in a bag or a bangle,” he told me when we bonded over fashion and our upcoming projects - his expanding QVC line PERFECT by Carson Kressley and my upcoming HSN appearances. Upon departing, I was gifted a sweat amount of swag that included: a straw beach tote, blue tie-die scarf (which I plan to use as a sarong and/or a halter top on my honeymoon), a cream cardigan, a summer makeup kit and two sets of Indian-inspired bangles. At 8:30 I was in my car with my fiance heading home, having opted out of another event that started at 8pm. This Brooklyn gal turns into a pumpkin at 9pm. Tonight I'm going out again. Ya twice in one week ... just as soon as I post this, finish a story for BagTrend, follow up on next week's HSN show, send some thank you notes, oh and get on a bus for 90minutes :). Thank you to everyone who came out to our BagTrends GREEN Arm Candy Party. 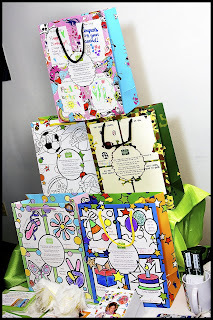 It was another fabulous event and the green twists proved that their are tons of environmentally friendly designers that any bagista would be proud to dangle from her arm. Vegan lovers flipped for designers like NOAH Handbags and Jane Marvel; sustainable/recycled offerings from Cork Design, Ashley Watson, Passchal, Simply Re-Gift It and Creollus dazzled and educated; lovely chrome-free leather goodies from Canopy Verde and TEICH pleased leather lovers; non-plastic bags from RuMe and FEED proved theirs no excuse to use plastic bags. NaturesofBeauty.com was on hand with non-toxic beauty and body products. Our Spa Room pampered guests with non-toxic manicures from Drs REMEDY Nails with the help of Manicures On The Move. Read all about it and see what celebrities and media darlings popped in for our press preview. Oh and in case you wanted to know: this is an image of me with Michelle Finkelshteyn my fab sister and the Creative Director of BagTrends.com. We're both wearing Eco-Skin dress. My fuschia clutch is from Teich and Michelle's black/white clutch is from Creollus.